If you're hosting a baby shower, preparing a few homemade favors is a great way to thank guests for showering the mom-to-be. You don't have to be a crafting genius or a master baker to create personalized and affordable baby shower favors that will charm anyone lucky enough to receive one. 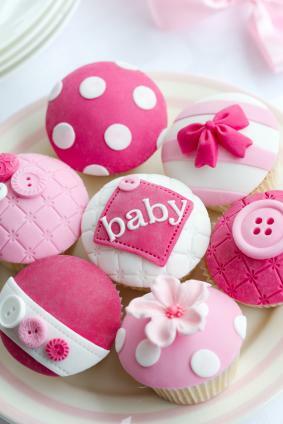 Button candy is a fun, retro treat for a vintage-themed baby shower, but it's also versatile enough to work for any theme. These treat bags are easy to make, and guests will love them. Cut the cardstock into rectangles with the decorative scissors. Each rectangle should be big enough to write a message to guests; about two-by-three inches is ideal. Punch a hole in one end of each rectangle and write "Cute as a button!" on the tag. Place some button candy strips in each cellophane bag. Tie the top of the bag closed with twine. Use the ends of the twine to tie on the tag and a decorative button. 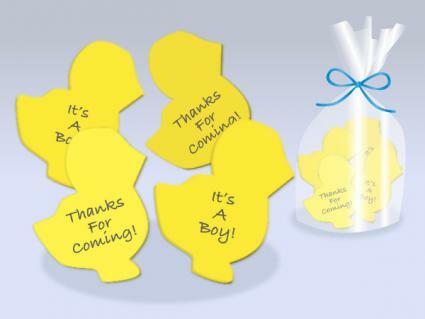 A magnet is a practical shower gift, and this fun favor is the perfect play on words for a baby boy's shower. The magnets are affordable and easy to make, and you can change the animal shape to suit any shower theme. Spread out the desired number of chick shapes on a newspaper in a well-ventilated area, and spray paint them yellow. Allow to dry. Use paint markers to add a special message to each one, such as "Thanks for coming!" Hot glue a magnet to the back of each chick. Package in a cellophane bag with a blue ribbon bow. 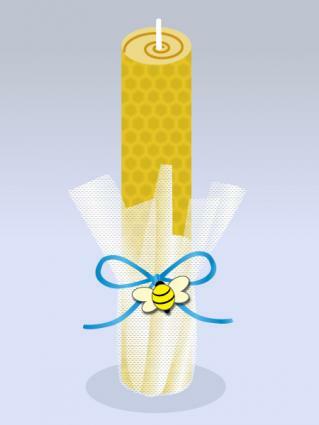 It's easy to make candles out of beeswax sheets, and this type of favor is perfect for a bee-themed baby shower. Alternatively, you can buy the wax sheets in any color to match the decor of the shower. Either way, you'll create a practical present guests will love. Cut the beeswax sheets into the size you desire. You'll need a strip that is as wide as the height you want your candle to be. Place a piece of wick material on one end of the sheet, and roll it up tightly around the wick. Trim the wick so it is about half an inch longer than the candle. Place the candle bottom-down on a tulle circle. Gather the tulle up around the candle, and tie it closed with a ribbon. 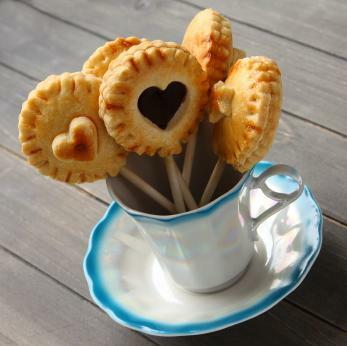 Cake pops are cute and popular, but pie pops are an unexpected treat that's even easier to make. Spread out the pie crust on a floured surface. Cut two circles of pie crust for each pie pop. On one circle, place a spoonful of jam. Place a lollypop stick so that it extends about three-quarters of the way through the circle. Brush egg whites around the outer edge of this bottom circle. Place the other circle on top. With a fork or a spare lollypop stick, press down all the way around the pie pop to seal the two edges together. Brush the top with egg white and sprinkle with sugar. Bake the pie pops in a 400-degree oven for about 20 to 25 minutes, checking frequently to avoid overcooking. When they are done, remove them from the oven, and allow them to cool completely. Place a cellophane bag over each pie pop, and tie with a ribbon. 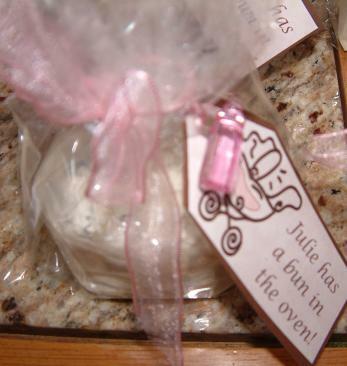 Everyone can have a bun from the oven with this tasty baby shower favor. You can use your favorite cinnamon roll recipe, or buy pre-made cinnamon roll dough from the grocery store. Either way, guests will love the tasty treat. Place an uncooked cinnamon roll in each ramekin and bake according to the recipe or instructions. Allow the cinnamon roll to cool, and then add frosting. Slip the ramekin into the cellophane bag. Add a cardstock tag that says, "A bun in the oven." There's nothing like homemade baby shower favors to show guests just how much you value their presence at your gathering for the mom-to-be. These personalized ideas are fun and charming, and they can take your shower to the next level.